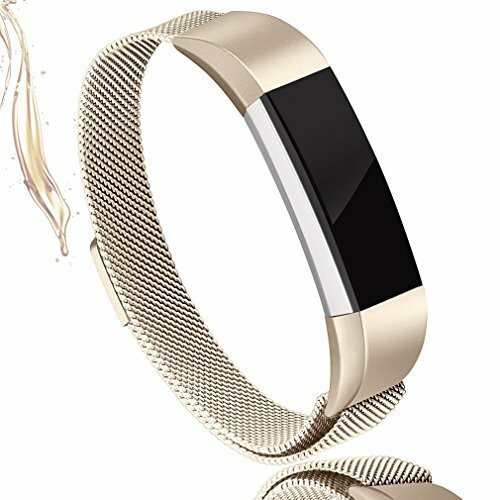 AK Fitbit Alta HR and Alta metal band personalized your Fitbit Alta HR 2017 / Fitbit Alta 2016 fitness tracker with this refined replacement premium stainless steel wrist band, milanese strap offers your Fitbit Alta HR / Alta a new noble,elegant and classic look. Small Size: for 5.1 inch-6.7 inch wrist. Large Size: for 6.7 inch-9.3 inch wrist. Color Available: Black, Blue, Gold, Silver, Rose Gold, Colourful, Rose Pink, Sakura Pink, Champagne Gold. 1. Milanese strap with its unique design makes your Fitbit Alta HR 2017 / Fitbit Alta lightweight, flexible, durable for wearing. 2. Exclusive Aluminium Alloy clasp and steel head, easy to put on & off your wrist. 3. Premium stainless steel material with solid wire mesh and magnetic Milanese loop, makes it comfortable and safe for the human skin, no allergies! 4. Great craftmanship, Eco-friendly, practical and dressy. Best gift for yourself , your family or friends! ONE YEAR WARRANTY, replacement or full refund without return. Please feel free to contact us if you meet any question BEFORE you review it. We will try our best to solve your problem. As a seller, our goal is to provide every customer excellent purchasing experience.